Celiac Disease was once called Celiac Sprue. It is sometimes medically known as Gluten-sensitive Enteropathy (a disease of the small intestine). Being directly linked to two specific genes, HLA-DQ2 or HLA-DQ8, Celiac affects 1-3% of the population making it the most common genetically induced food intolerance. Although it is more common than Ulcerative Colitis, Crohn’s Disease, Inflammatory Bowel Disease, and Irritable Bowel Syndrome, Celiac is less known by the public, less recognized by medical staff and less accurately diagnosed than any of the above conditions. Screening of first degree relatives for those with Celiac (parents, siblings, children) is essential because it’s hereditary and close relatives have an increased risk by at least 10%. Others at an increased risk of developing Celiac are those with Type 1 Diabetes, Autoimmune Thyroiditis (Hashimoto’s Disease), Down Syndrome, Turner Syndrome, and William Syndrome. Celiac is the only autoimmune condition we know of that occurs in genetically predisposed individuals. Eating gluten initiates an immune response. Gluten is a protein most commonly found in the grains wheat, barley, and rye or any grain related to these three grains. Damage to the mucosa lining of the small intestine occurs due to an immunologically (allergic) inflammatory response. 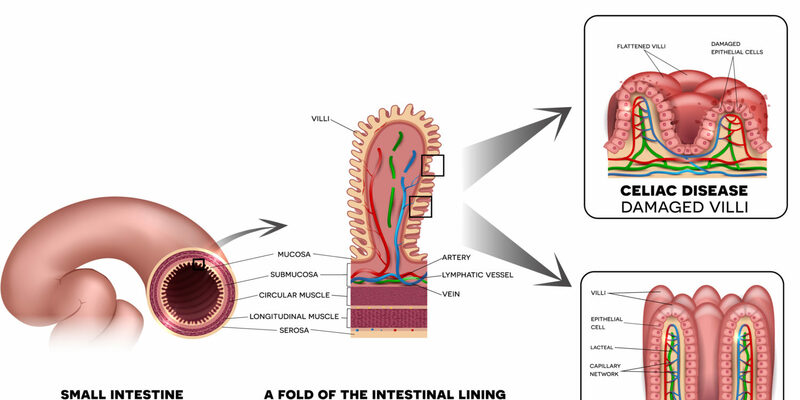 Small finger-like projections line the intestine and are called villi. These villi allow for more surface area and increased absorption than if the gut lining was flat and smooth. Each villus is structured to absorb nutrients, vitamins, minerals, fluids, and electrolytes into the bloodstream. At the microscopic level, the villi are the direct way we digest and absorb food. When everything is working the villi properly on the surface of the lining of the small intestine absorb nutrients our bodies require and keep out large unwanted particles or pathogens. Think of it as the texture of a terry cloth towel. A towel with lots of strands or threads absorbs water very well, whereas a plain sheet of cotton without the fringe does not absorb as much water. In the case of Celiac disease, the villi become inflamed, damaged, flattened, blunted and destroyed and cannot function to absorb nutrients. This malabsorption of nutrients leads to many gut related and other symptoms. Because of villi damage, essential nutrient mal-absorption contributes to malnutrition and other medical problems. As crazy as this number sounds, as many as 97% of people with Celiac continue to be undiagnosed. As discussed above there are so many symptoms that the medical staff often overlook these signs or think they indicate some other medical problem. Screening for Celiac can be easily accomplished by testing the blood for an antigen (a molecule which causes an immune response in the body). IgA (immunoglobulin A) is an antibody present in gastrointestinal secretions. In rare situations, IgG (immunoglobulin G) can be ordered if the person has a deficiency in IgA. These blood tests analyze distinct antigen reactions to gluten. To be properly diagnosed with CD the first thing to do is to STAY on a regular (NOT a Gluten Free Diet) and get a blood test. One must be eating food containing gluten for the body to have a reaction, produce an antigen in response to the gluten and for the antigen to show up in a bloodstream during the testing. Several blood tests can detect specific antibodies produced by the body when gluten is ingested. Once no gluten is eaten, the antibodies are no longer produced which will cause the test to result in a false-negative result. Do NOT start a begin a Gluten Free Diet until after getter tested. (This is the key to treatment; Celiac is controlled by a Gluten-Free Diet, and the undesired antibodies disappear). How does one get diagnosed with Celiac? Tissue Transglutaminase – tTG – IgA (IgG) Very specific, highly sensitive and the single best test to use. Quantitative immunoglobulin A – IgA Measures the total level of IgA in the blood to be sure the person is not IgA deficient which can lead to a false negative. When the IgA is deficient, the IgG is used for the other tests. Antigliadin – IgA & IgG Least sensitive, widely variable and this test is no longer used to diagnose Celiac Disease. When a blood test is positive, it is recommended to have a tissue biopsy to CONFIRM and evaluate the extent of the small intestine damage. Small Intestinal Biopsy with 5-8 samples from the duodenal bulb and distal duodenum. Endoscopy, NOT a colonoscopy is the procedure required for these biopsies. Lastly, because more than 96% of those with Celiac have a specific genetic marker, genetic analysis can help detect CD if the above blood test comes back negative (remember there can sometimes be a false-negative). HLA-DQ2 or HLA-DQ8 It is extremely rare to have Celiac without having one of these genes ( less than 5%). After the diagnosis is confirmed, the only remedy is a strict Gluten Free Diet. Avoiding all foods containing any amount of Wheat, Rye, Barley or related grain. There are plenty of naturally gluten-free food items. However, this is a complex diet, because gluten is used in the manufacturing of so many different processed foods. Gluten has some excellent food production qualities lending making it a perfect ingredient in many products. This includes the highly elastic properties useful in baked goods, the flavoring used from barley (malt) and using flour as a thickener (for soups, sauces, etc.). Label reading to determine the ingredients of every food eaten is an essential skill when following this diet. Following a 100% Gluten-Free Diet will allow the small intestinal lining and villi to heal. Healing damaged tissue in the small intestine improves nutrient absorption and decreases inflammation in the body. This is the overall goal of adherence to the Gluten-Free Diet. As the small intestine heals, the body will better absorb nutrients from food resulting in the body becoming better nourished. It is so much more than just not eating bread and pasta. Label reading is complicated but can be learned and understood making choosing foods easier. A knowledgeable Registered Dietitian Nutritionist can help teach those with Celiac how to adjust and follow this strict diet. Contact me if you need help with following a Gluten Free Diet or if you are wondering about Celiac.